China is set on covering a lot of lost ground in its race of becoming a full fledged space super power, and its progress so far has been phenomenal. The latest news from the Chinese space agency comes in the wake of a successful test for a super-rocket engine, which will be deployed in the next-generation of boosters, and help the nation in its goals of building its own space station and landing on the moon. Speaking of which, Chinese officials have also recently announced that it will blast off a lunar probe for the moon in the second half of 2013. If successful, the landing would be China’s first on the lunar surface and mark a new milestone in its space development. The new super-engine is based on liquid oxygen (LOX) and kerosene, and has been designed for China’s planned Long March 5 rocket, which will be more powerful than the current Long March 2F that have been used to both deploy China’s test space station module, Tiangong-1, and transport a crew of three, including the nation’s first female astronaut, for a 13-day stay at the module. The engine was subjected to rotational tests of almost 20,000 revolutions per minute, and was exposed to temperatures of up to 5,432 degrees Fahrenheit (3,000 degrees Celsius) for 200 seconds. It performed without flaws, much to the delight of Chinese officials. Also, liquid oxygen and kerosene engine is non-toxic and pollution-free, according to officials. The engine will be capable of 118 tons of thrust, compared to the 74-ton-thrust engines used on the Long March 2F rockets – this translates in around 25-ton payload carrying capability in satellite low-orbit, or 14-ton payload into geostationary orbit. 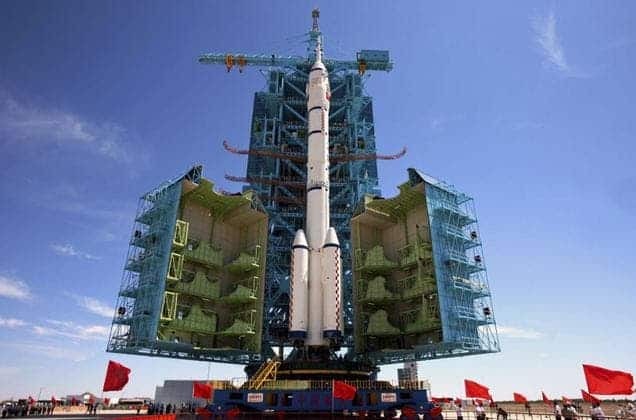 The Long March 5 is expected to aid in China’s efforts of deploying its own space station in orbit by 2020; efforts which so far have extremely promising, considering Tiangong-1 was a sound success and most of their projects have been deployed on schedule. The rocket’s maiden launch is expected to occur in 2014, according to China’s state-run Xinhua news agency. Concerning its moon ventures, China has announced that it will launch a probe in the second half of 2012 destined to land on the surface of the moon – marking another milestone. The communist state has launched two other probes to the moon before, Chang’e 1 in 2007 and Chang’e 2 in 2010, both named for the Chinese goddess of the moon, but these didn’t land. The new project is destined to orbit, land on and return from the moon. According to China’s current space mission schedule, a manned landing on the moon is expected by 2025. Despite China is currently pursuing goals already completed by the US or the URSS some 50 years ago, the amount of progress it has made in the past decade alone is astonishing.